Out of the Park Baseball 9 is an award-winning baseball simulation that GameSpot called "the best baseball management sim out there". 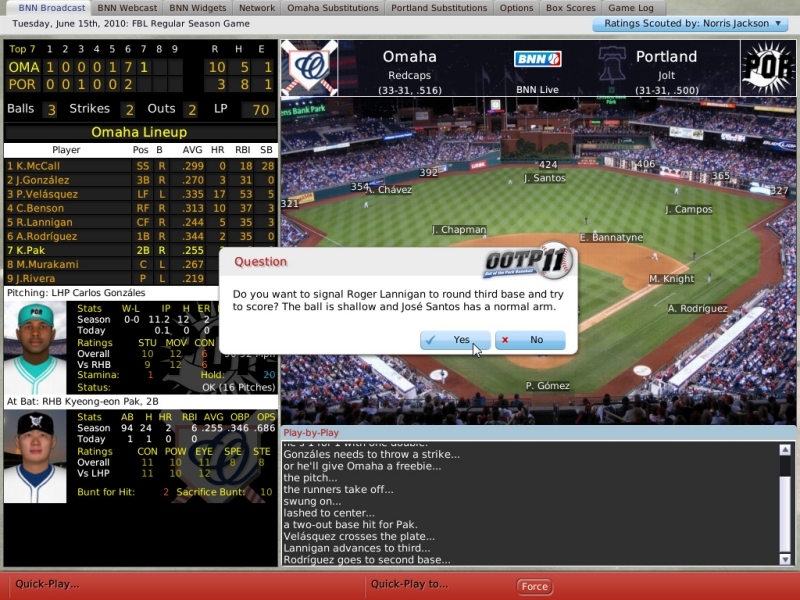 OOTP offers unparalleled flexibility in creating your own baseball world. Includes online or solo play, real/fictional rosters, historical sims, drafts, trades, scouting, and more! Create your ideal baseball world, and manage it at a high level, or play out every game and manage each pitch. Try our free demo! ...... For the ultimate challenge, join an online league and test your mettle against other human players! OOTP 9 is the closest most people can get to being the general manager of a real baseball team. Handle GM tasks like drafts, trades, scouting, waivers, team finances and personnel. Negotiate player contracts. Or, dive into the more hands-on management and set your team's lineups, pitching staffs, and in-game strategy. You can oversee your league at a high level, or play out each game, managing pitch by pitch. Watch the Web sites that users on your network are visiting in real time. Change the startup options and layout for your PDF files. OutNote - The software to attach notes to Outlook eMails and contacts. Convert Microsoft PowerPoint to YouTube video. The top of the chart remake of good old classic Arkanoid game. Qweas is providing links to Out of the Park Baseball (PC) 13.9.32 as a courtesy, and makes no representations regarding Out of the Park Baseball (PC) or any other applications or any information related thereto. Any questions, complaints or claims regarding this application Out of the Park Baseball (PC) 13.9.32 must be directed to the appropriate software vendor. You may click the publisher link of Out of the Park Baseball (PC) on the top of this page to get more details about the vendor.